Through years of extensive testing and refinement, Blue Ridge Fish Hatchery has developed what they feel is the perfect diet for koi and goldfish. The health, growth and appearance of koi and goldfish are directly related to the quality of the fish food used. The food is only as good as the ingredients used. Blue Ridge's Koi and Goldfish Food contains the proper levels of protein, vitamins and minerals that have allowed Blue Ridge to produce literally tons of healthy goldfish and koi for the water garden industry. This year features enhanced diet with the addition of Encapcell, a microencapsulated nucleotide designed to increase growth and prevent disease. (Go ahead, Google it!) This all-season diet contains stabilized Vitamin C and all food elements for increasde growth and vitality. If you want to, you can feed up to four times a day once water temperatures go over 50 degrees. You can still feed this food once a day at temperatures ranging between 40 and 50 degrees. (Yes, the same food!) Do not feed below 40 degrees. We also have the Blue Ridge Food in Cool Water Wheat Germ for those who want to feed their fish a more easily digested floating food. At any temperature, do not leave uneaten food longer than ten minutes. 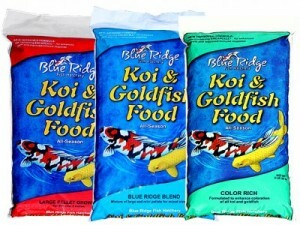 Blue Ridge Blend Koi & Goldfish Food 2 lb. A year-round diet formulated to produce maximum growth with minimum waste. Mix of two pellet sizes, 1/8" mini pellets for fish under five inches and a 3/16" large pellets for larger fish. Designed for pond owners with mixed sizes of fish. Blue Ridge Blend Koi & Goldfish Food 5 lb. Blue Ridge Blend Koi & Goldfish Food 25 lb. Blue Ridge Color Rich Koi & Goldfish Food 2lb. This diet contains the same ingredients as the blended food. We have added three proven color enhancers, marigold extract, spirulina, canthaxanthin. Feed this food for 30 days and watch the reds on your koi and goldfish intensify. Large 3/16" pellet only. Blue Ridge Color Rich Koi & Goldfish Food 5lb. Blue Ridge Color Rich Koi & Goldfish Food 25lb. Blue Ridge Cool Water Wheat 2lb. Blue Ridge Cool Water Wheat 5lb. Blue Ridge Cool Water Wheat 25lb. Made in the USA with monorail construction. This means the net is encased inside the bow, virtually eliminating wear on the netting. All are constructed of Aluminum with replaceable nylon netting. Our dip nets are ideal for getting out leaves or removing fish from the pond. Please note: larger nets are available at the nursery - we can not ship them due to the length (7+ feet). 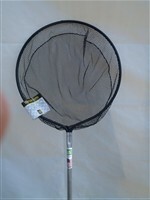 Four foot handle, with deep net: 12 x 13 x 6 inches deep net with 1/8 inch mesh. Additional shipping charge: $25.00. 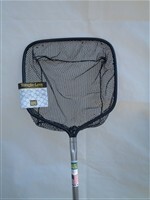 18 inch handle, 9 x 6 x 4 inches deep net with 1/8 inch mesh. Loki Tangle-less Utility Nets - 16" x 16"
A replacement net for the model BD-3. Keep the food in one area to increase viewing pleasure of fish. Open circle floats on the surface, containing the fish food in one area. Works well to keep the food out of the skimmer. Easy to read Fahrenheit-Celsius scales. Measures frpm 120 degrees to -20 degrees Fahrenheit. Same display features as the Floating Thermometer except this version is weighted and features a tether string to make it easily hidden and for easy removal.